I’m in Boston still, getting trained at HQ, Doc Searls is also in the area, as he’s working at Harvard, I stopped by for lunch and learned a few things, now to share with you all. 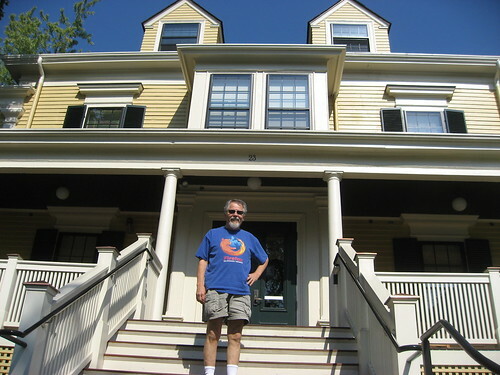 Doc Searls, co-author of Cluetrain manifesto, was a CA native, who recently moved to Boston, to work at Harvard’s Berkman center, for Internet & Society. During lunch we discussed the “Alpha Paramecium” syndrome that’s happening with many of the top tech bloggers, and how they’re jockeying for top placings in Technorati and Techmeme (the petri dish). In the past, I was guilty of this too, but it’s sad to see that there are some bloggers that just echo whatever else someone else is saying without adding much additional value, I mean, how many viewpoints do we need on a single rumor? Looking back at the influential Cluetrain, I’m not surprised that Doc’s focusing his energy at the Berkman center, he’s working on a few projects that are shifting the power from institutions (like companies or health care systems) over to the people, where ownership of personal information would be better served. One such example, the Vendor Relationship Management (VRM) where Doc gave me a real world example where he had to seek medical care and the multiple vendors involved requiring multiple inputs of his personal information. Applying it back to our lives, how many times do we have to fill out forms to register for websites a year? We certainly have a problem with data inconsistency due to multiple registrations. “In The Intention Economy, the buyer notifies the market of the intent to buy, and sellers compete for the buyer’s purchase. Simple as that. Are consumers ready to take control of their decision making process, or do we still need the marketers to tell us what to buy? Movements like these must come from the customers first, are they sophisticated enough to lead these? If so, institutions would only then follow. Sadly, I question if the average consumer has the knowledge, or cares enough to lead the bottom up revolution, it doesn’t mean it’s not worth trying, it’s just that we should evaluate the challenges up front.